The first leg of the champions league match between Valencia CF and Schalke 04 is over and Valencia is left bitter and surely bemoaning the missed chances and opportunities it had. Unai Emery decided to play with the 4-1-2-1-2 formation which some may know it as 4-3-3, but its essentially different than standard 4-3-3. Anyways the standard line-up for this formation was selected with Topal as the defensive midfielder to cover at the back and get the balls from the back to the midfield and then Banega and Tino costa, with Banega playing as a playmaker and Tino Costa in a more attacking fashion. Chori Dominguez is a bit forward, just behind the channels and his role is to basically run channels and create an extra men, so that our two strikers can abuse that space and score goals. The match started with Valencia in possession, the ball circled in the midfield and then usually passed on the left side where Mathieu would act as a winger. After 17 minuted this play proved very good and beneficial, as Valencia scored a goal after that play. Aritz Aduriz passed the ball to the oncoming Mathieu who ran past the Schalke right back and crossed the ball towards Soldado who managed to score from a pretty difficult position and Valencia was in the lead as early as the 17th minute. From there on it was basically all Valencia with continuous attacks towards the Schalke goal and there were several good opportunities missed out. Topal and Tino tried long range shots but one was above the goal and the other headed straight into Neuer's hands. Mathieu was playing very good on the left side as a winger and was constantly making crosses in the penalty area and linking up well with Tino Costa as well. Aduriz had a wonderful chance to make it 2-0 after being released by a smart and precise Tino Costa pass, but Aduriz somehow managed to ruin this chance and seriously I think that you need to try really hard to miss that kind of chance and even then I don't think its possible, but Aduriz did it and failed to put Valencia up by two goals. Schalke on the other hand had few chances of their own as well, which looked rather dangerous due to Valencia's defense being so shaky. There were two real chances for Schalke early in the match where Guaita was forced to save and one actually went close to going in after Miguel was outjumped and the ball headed towards the far left post in a lob like fashion, but Guaita just barely managed to somehow get to the ball and force it over the bar, save the goal and keep Valencia in the lead. The first half ended with Valencia leading 1-0 and the play was good with quite a few chances, firm control on the field, fast paced attacks. Valencia was the better team and from what anyone can tell it was headed towards a comfortable victory. The second half started much in the same fashion as the first with Valencia with firm control over the game and attacking most of the time. At the beginning there were few scrambles in the Schalke penalty area, Soldado and Aduriz were trying to make something out of some loose crosses, but the danger was always cleared by Schalke defenders. Then Aduriz had 3 chances in a row to put Valencia 3-4 goals ahead and close the match, but he ended up ruining all of his chances. The first one he shot instead of passing, but the shot was not accurate and flew over the goal, on the second try he touched the ball weird and it was neither a shot, nor a pass and the ball ended wide of the goal once more. He had a decent chance later in the match where he missed a timing window in which he slid to redirect the ball towards goal after a cross from the left side. In the 64th minute Schalke started a counter attack, Jurado was moving the pass forward with Topal covering him, but managed to get the pass towards Raul and after Navarro failed to get the ball off of Raul in what should have been an easy thing, Raul released a low curved shot and went past Guaita and in the net, Schalke managed to equalize. Emery did a double change with Joaquin and Vicente for Banega and Chori, but it was pretty clear that reverting to a 4-4-2 formation won't help and we weren't really needing wingers, but rather another striker to take Aduriz place. If I was on Unai Emery's place I would have introduced Pablo for Aduriz, move Chori as an attacker and Pablo in the attacking midfield position because he can actually play well there and is good at finding out players with some dangerous passes. Then after some time see how things go and then remove Banega and put Joaquin. Joaquin would go to the right wing and the formation would essentially become 4-2-2-2 with Tino and Topal furthest back in the middle, then Joaquin and Pablo a bit forward with Pablo in a free role as an attacking midfielder and Joaquin on the right side as his usual position of a winger and then the two strikers. I really think this would have worked better instead of falling on the 4-4-2 formation and hope it works, which we saw it didn't. Anyways after Schalke equalizer Valencia went forward even more, the two substitutions brought freshness on the wings but you can see the other players were beginning to slow down, Tino Costa was making bad passes, even worse crosses and losing the ball as soon as a Schalke player came close to him. Joaquin had few dribbles on the right but he would end up dribbling 3 defenders and loose the ball, and on the other side on the left wing Vicente wasn't any more useful as he was loosing the ball often as well. There was a decent chance after a low cross went from the left wing but Soldado and Aduriz missed the ball each by only milliseconds. Just before the end Schmitz was shown a second yellow and automatic red card. What was the reason I have no clue as the linesman came towards the main referee said few things and the red card then came. Ultimately the match ended 1-1 and it is disappointing for the Valencia fans and I'm sure the players, but not all its lost. The players played really good, had really fast pace and the attacks were quite fluid and dangerous, the only problem was in the conversion of these chance. If Valencia managed to convert only 30% of its chance it could have been 3-0 right now and not a measly 1-1 draw. Its not a great result, but its not terrible either and Valencia still has a good chance to beat Schalke and continue in the tournament. All Valencia need to do in the second leg is score a goal and things will get back level again and from there on its anybody's game. Valencia CF (1): Guaita; Miguel, Ricardo Costa, David Navarro, Mathieu (min. 77, Jordi Alba); Éver (min. 67, Vicente), Tino Costa, Topal, Domínguez (min. 67, Joaquín); Soldado y Aduriz. Schalke 04 (1): Neuer; Uchida, Howedes, Metzelder, Schmitz; Farfán, Kluge, Matip, Jurado (min. 81, Edu); Raúl y Huntelaar (min. 88, Hao). Goals: 16th min. 1-0, Soldado; 64th min 1-1, Raúl. Guaita 8 - Made 3 brilliant saves, had a really difficult save to make after a headed lob towards him and then in the second half another dangerous shot that was fired towards him in the final stages of the match. Miguel 6 - Good defensively, out jumped only once and provided a good support in the middle as he was receiving and passing the ball. Navarro 3 - Not a confident performance, he was beaten few times and had to use nasty fouls to stop the opposition though went unpunished. 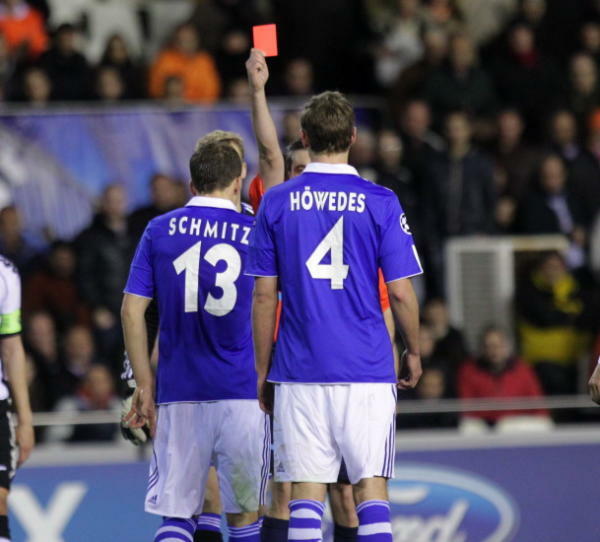 At fault for Schalke's equalizer and along with Ricardo Costa were probably the weakest link in the team. R. Costa 4 - Little better than Navarro, but beaten few times as well, made a mistake when passed the ball towards Guaita, but the ball went close to a Schalke attacker and Guaita was forced to slide out of the penalty area and kick the ball out. Mathieu 7.5 - Played as a winger all match long, but still managed to return back in time and defend. Won all of his duels with Farfan and easily disposed of any danger from the left and assisted for the goal. Topal 6 - Partially at fault for Schalke equalizer and he wasn't really committed to stopping the pass towards Raul, he could have denied any chance had he committed more and just put a foot forward, otherwise had a decent match. Banega 6 - Good in the first half, passed the ball with good fluency and kept possession. Barely visible in the second half. Made several bad passes, lost the ball few times and was obviously substituted. Tino 7 - Very active in attack, provided several great passes than mainly Aduriz couldn't capitalize on, came back fast and defended with urgency. Got tired later in the second half and his play became sloppy. Chori 5.5 - Had few decent runs but mainly on the wings, several passes and few nice touches but that was about it. Aduriz 1 - Worst match in Valencia shirt. He had 3 amazing chances to score, but ruined all and on top of that had few other decent opportunities, but failed to make anything out of them. Soldado 6 - Hard working and enthusiastic, scored a beautiful goal and the ball seemed to fly to him in the first half. Somewhat less visible in the second half, lost quite a bit of duels in the penalty area and failed to race to the ball after a good cross in the later stages of the match. Joaquin 5 - Obviously motivated and willing to do something, but ended up dribbling himself on the wing and lost the ball every time. Needs to dribble once and then quickly pass or cross, right now he dribbles, dribbles, dribbles and looses the ball. Vicente 4.5 - Lacks match form and it was all too obvious in his time on the pitch. Had few bad touches, missed passes and a lack of understanding with Mathieu and then Alba on the wing. Alba N/A - Not enough time, though did have one good cross.